Wildlife Services, the deadly and secretive federal agency, is back in the air. 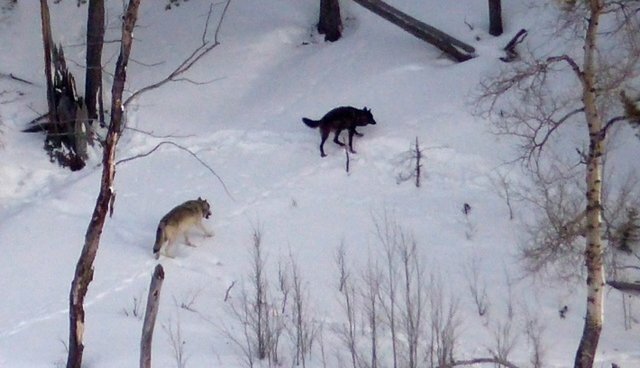 In February, their gunners in helicopters slaughtered 19 wolves in the remote Lolo region of Idaho. The killing was kept secret until recently. While I shake my head in disgust at this agency's mission and methods, I find another bitter pill to swallow: all of us help fund Wildlife Services with our tax dollars. The amount paid by taxes is reduced by income from what the agency calls "cooperators"- counties, public institutions, private businesses, or special interest groups that want animals removed and will pay the agency's bargain rate. Idaho's Department of Fish and Game paid Wildlife Services to rain down death on the Lolo wolves. The other four Rocky Mountain wolf states also use the agency. Here's how much was spent in each state in 2013 (most recent data) and the percentage of that total paid by taxpayers. Idaho, site of the recent slaughter, managed to get us taxpayers to pick up three-quarters of the tab for their wildlife killing. While Wildlife Services reports the amount paid for their deadly work, they do not reveal the reasons for removal or exactly what they did. That secrecy is one of critics' biggest complaints. "Wildlife Services is one of the most opaque and obstinate departments I've dealt with," said US Representative Peter Defazio. "We're really not sure what they're doing." Defazio, then the ranking member of the US House Committee on Natural Resources, questioned the agency about its lethal methods and poisons. He's still waiting for an answer. Defazio is not alone in his wondering. In late 2013, the US Department of Agriculture's Office of Inspector General announced that it would audit Wildlife Services. Tom Knudson, from the Center for Investigative Reporting, reported recently that the audit still hasn't been released. When it will come out and what it will find is anyone's guess, he says. Knudson, a Pulitzer Prize-winning environment reporter, once asked to observe Wildlife Services' lethal predator control in action on public land in Nevada. Their answer: no. Knudson says he was shocked because, "Even the military allows reporters into the field on its missions overseas. Here at home, on land owned by all Americans, Wildlife Services does not." Wildlife Services has delivered death under various identities and hidden within different departments for more than 100 years. Some say it helped clear the west for our nation's expansion. But times have changed and so have public attitudes about protecting wildlife. It's time for Wildlife Services to stop the senseless carnage, to be open about what they do, and to focus on nonlethal control. Click here, to read Tom Knudson's latest report on Wildlife Services. Rick Lamplugh is a wolf advocate and author of the Amazon bestseller "In the Temple of Wolves: A Winter's Immersion in Wild Yellowstone." Click here to order an eBook or paperback or a signed copy from the author.